Point-to-Point soldering is no fun. PCB is where it is at. As a hobby enthusiast, I enjoy designing and fabricating my own boards. My method of choice up to this point has been toner transfer. While I have had some successful boards, the toner transfer part stresses me out big time. I’ve tried irons and laminators. I’ve tried photo paper, magazine shiny paper, special purpose blue transfer paper, cooking parchment. All of them give me inconsistent results and generally stress me out. My next hope is UV exposure and pre-sensitized boards. Laser printing a transparency seems stress free. If I have a reasonable way to expose the board to UV light, I’ll be in business. Instructables - UV LED Exposure Box. I made a custom version of the light panel for my Phase 1. Just Add Electrons - Enclosure and Controller. Turbokeu - PCB exposure controller with good ideas about the transparencies. PCB fabrication tutorial - PCB Fabrication tutorial (site was formerly called Engscope). Some people use UV to bronze their bodies. I use it to make printed circuit boards. This is my UV LED Exposure rig. Drawn from the inspirational sites above and my own creativity. 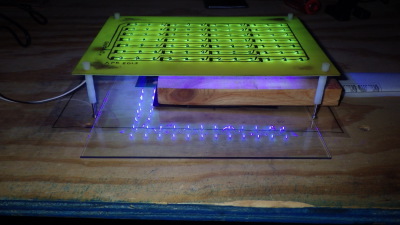 The first step was to build a simple UV LED Matrix, loosely following the light panel steps from the first Instructable link above. I replaced the Veroboard with a custom PCB designed in Fritzing. Very simple circuit of 12V input, a single resistor, and 3 LEDs connected in series to GND. Repeated 28 times, resulting in 28 resistors and 84 LEDs. When designing the PCB in software, I manually enlarged all traces and left wide clearances, a decision I was thankful for. I had some recent success with toner transfer using parchment paper and a modified laminator. On small boards. This is a 9x6 inch gigantor. She doesn’t heat up very well, leaving toner a stone cold mess when attempting transfer with parchment paper and laminator or clothes iron. A third attempt with some 10 year old press-n-peel blue stuff and a clothes iron gave me enough of an outline to work with. I rolled up my sleeves, got a magic marker, and drew the entire circuit by hand. Let dry for 2 hours. Etch with some fresh H2O2/HCL and we’re good to go. Tons of copper to etch because I didn’t use a copper flood. I had enough trouble with toner that I didn’t want to add a massive plane to the mix. After etching, before acetone to remove toner. You can see where I did not apply the magic marker, relying upon the Press-n-Peel that transfered via iron. Plus there are the remnant copper planes where I chickened out and removed from the etching bath before traces got cut. I figured it was better to have some residual laying around rather than undercut wanted copper and at 22 minutes of etching I pulled the plug. The traces were so wide to begin with, it would not have caused any issue to stay in the bath a few minutes more. I am the strongest man alive!!! 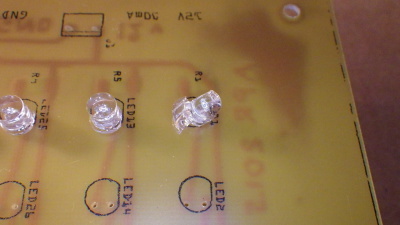 The drilled holes for this LED were the slightest bit wider than the physical dimension of the wires coming out of the LED case. As I pinched down to press it flush with the surface of the board, POW, she shattered right in my hand. Delicate treatment with a pin vice to widen the holes solved the problem. The broken LED is added to my trophy room of destruction. I paid close attention to aligning the LEDs. They are wide angle enough (120-140 degrees) that they overlap nicely at even a close distance. My TLC was more for my own fun rather than function, but this whole exercise is for my own fun so that works just fine. Technique was to do each column of 7 LEDs at a time (repeat times 12 rows), solder one leg of each LED. Then stand the board up vertically and with left hand, hold the board while pressing one finger firmly on an LED, meantime right hand applies soldering iron to the lead. Using this method, the LED would snap right into the board and sit nice and flush. Once the column was done for a single lead, visually inspect to ensure good alignment and perform fine level corrections. Then solder other leads to finalize the process. The way the board is laid out, I can test the results every 3 rows. Very happy robot maker when that first group of 21 LEDs light up like the 4th of July. Once I had my LED Matrix complete, I was ready to play with a real live circuit. The first step is to select a distance between LED Matrix and presensitized PCB surface. To choose a distance, I simply added some standoffs and the longest 3MM screws I had and took a look. At that distance there were still some ever so slight visible “focal points” of light on the surface. Add a few more standoffs resulting in a 5cm distance between LEDs and target PCB, providing nice and even illumination, at least when inspected visually. Good enough to get started. 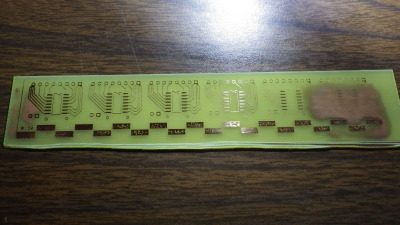 The idea behind the exposure test is to make a strip of PCB and expose each section of it for a different amount of time. This is achieved by laying an opaque barrier over the board, exposing only the first section to begin with. At set intervals, slide the opaque barrier to expose the next section (plus keeping the original section exposed, now for a second interval). Repeat this until the whole board is exposed. 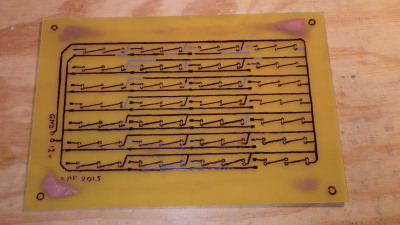 Once you complete this, you develop the board and see which photoresist pattern came out the best. 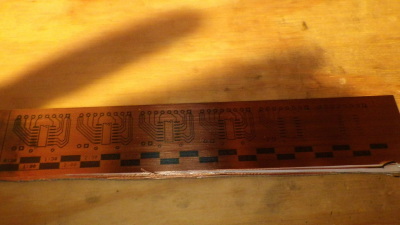 Follow up with etching the copper to really get the results at an electronic level. The section that works best becomes your desired exposure time for real boards. Here is the circuit I used. There are timing intervals along the bottom with solid blocks of resist/copper and the text of how much exposure time. I had no idea what to expect so I just went with 10 minutes total, broken into 20 segments of 30 seconds each. The top part is a nonsense short-circuit extravaganza with a surface mount IC, a header, and some narrow traces run close and parallel. It was designed with Robot Room Copper Connection (sadly does not exist anymore). She is in action during one of the early exposure increments. You can see the block of wood sitting on top of some thick black card stock forming the moving opaque barrier. Every 30 seconds I would slide it along the glass to expose an additional section of board. It was kind of like watching water boil or paint dry, I was very excited to get to the end and see the results. Patience, patience, 10 minutes is not really that long, is it? Time is up, turn off the UV, remove the glass and transparency, throw the board into the developer. The instructions said to expect 1-2 minutes, I had nearly instant results. By the time I could grab a sponge brush to wipe the board inside the developer solution, the resist had mostly already dissolved. I kept it in there about 20 seconds just to be sure, but was concerned I might over do it and destroy the good resist and invalidate my test. After I washed it off in water, I turned on the lights and didn’t know if that would kill the remaining resist by exposing to more light. I quickly snapped a picture, getting some nice shadows of my hand in the process. Here she is sitting in some HCL/H2O2 (which is actually mostly CuCl2 right now, if my chemistry is right). This is the same solution I used the day before to etch the LED Matrix, which means it ate quite a bit of copper. Today with the test exposure board, 20 minutes yielded essentially zero etching. Pour a small batch of fresh echant and a few minutes the board was done. Visually, the results of the developer examination are confirmed, the 1:30-2:30 look the best. Electrical continuity test with multimeter reveals some issues out in the 2:30 range, but perfect results in 1:30 and 2:00. Future exposure time will be 1:45. Pits in the solid copper region, even in the optimal 1:30-2:00 zones. Others suggest making two transparencies and carefully align them. This elimiates/reduces poor print quality from my laser printer. Cutting the PCB. The bottom edge in the picture is attrocious. I was nervous about exposing the board to light once I pulled it from the bag. Working in the dark, I manually held a block of wood in place as a straight edge and used a utility knife to score the board. I’m surprised I didn’t remove a finger in the process, and the cut edge is awful. I’ve since discovered that you don’t really need darkroom conditions until you remove the peel-off backing, so cutting the board can be done in well lit conditions with no rush on time. My future robots thank me for learning (and remembering) this. All in all, this test was a big win. Lots of mistakes and learning along the way. Despite those hicups, the resultant exposure time of 1:45 has great potential if I can get this level of quality, fine traces, close spacing on my very first board. A real treat when considering the toner transfer methods of the past. These are the steps I use given my current (Phase 1 as of this writing) rig, materials, and supplies. Many steps can be reduced or eliminated with a nice quality enclosure and controller, but I’m taking baby steps here. Make sure it is oriented such that toner side goes to the board. Print 2nd copy of transparency. Cut one to smaller size, align them, and tape together. 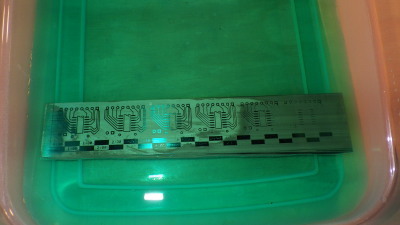 Place PCB on work surface, presensitized side facing up. 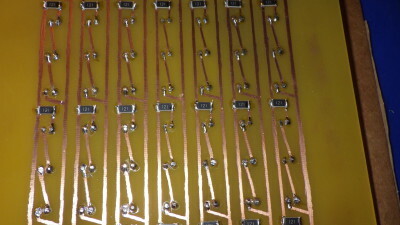 Position transparency (toner side down) over PCB. 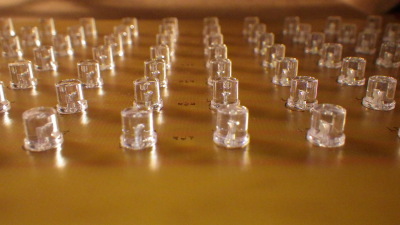 The LEDs are rated 3.0-3.4V. Full circuit = 0.240 watts for the full 3 LEDs and 1 resistor. So, need 28 (some day 56) 120R 1/10 or 1/4 watt resistors. about $9 for 70 of them. Each 3 LED segment is .24 watts. Each 3 LED segment pulls 20mA. Go to Lowes or Humpey Doe and pick something out, roughly sheet of paper sized.